Always nice to start the weekend with some fresh music. Today we have teamed up with Transcending Obscurity Records to host a stream of Affliktor’s “Backwards into Hell,” from its upcoming self-titled release on October 20th (through Transcending Obscurity of course). As usual, if you dig what you hear below, feel free to click on the Bandcamp widget to hear a few more tracks and/or PRE-ORDER the album. There’s even a box set available, containing a certificate, guitar pick, sticker, and poster. 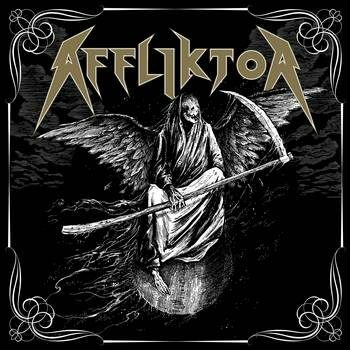 Affliktor is the newest band from Toby Knapp, who has been seen many a time here at DR through his work in acts like Waxen and Where Evil Follows. “Backwards into Hell” blends black metal with thrash, and unleashes quite a firestorm in the process. The riffing is intense, and rather headbang-friendly due to it’s aggressive and assertive force. But even with only about 3:30 in the track, there’s time for a rather shreddy solo – one that stands up to the high standards of Knapp’s previous efforts. Listeners can expect a high-energy blackened thrash effort with plenty of seething melodies.